Park City is synonymous with ski-in/ski-out living and for its variety of slope-side lifestyles like luxury hotels, condos, cabins, and fine homes. 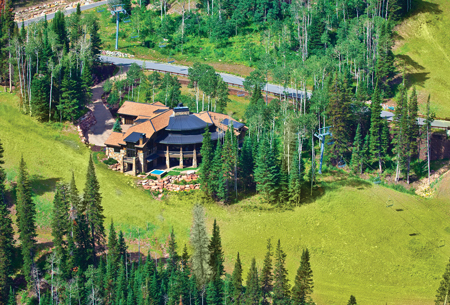 Western Home Journal looks at the conditions that came together for ski-in/ski-out to flourish in Park City and how the homebuilding industry has focused on design and amenities to enhance its enjoyment. Ski-in/ski-out adds that extra layer of wonderfulness to the ski experience of no worries about parking, loading, and hauling gear. One imagines waiting for just the right moment when the weather clears and the snow is at its peak, and then swooshing down the mountain. In Park City, there is such an abundance of living on the mountain that it is easy to take this experience for granted. 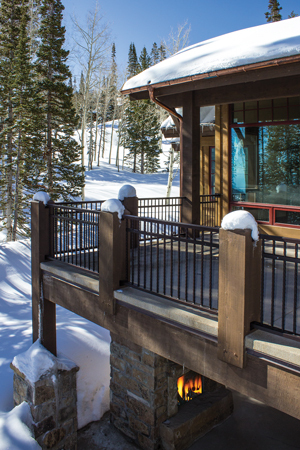 Slope-side living has taken hold to become an important part of the local lifestyle during all recreation seasons, and local architects and builders comment on how careful consideration of ski-in/ski-out access can enhance the experience. Others are looking at Park City’s slope-side living reputation. “Based on our research of available data, the Park City Convention and Visitor’s Bureau is comfortable saying that Park City is home to the most ski-in/ski-out luxury lodging brands in North America,” comments Christiaan Boer, Communications Coordinator with the Bureau. It seems that Park City’s mining heritage provided the foundation for the abundance of private land on the area’s ski mountains. Soldiers found silver in late October of 1868, and established Flagstaff Mine, and Ontario, Crescent, Anchor, Mayflower, and Silver King mines followed. The old mining claims led to private ownership. It was almost a hundred years after the first strike when Park City opened skiing as a strategy to provide economic development to the struggling area undergoing mine closures. Deer Valley opened on the land of the former Snow Park resort with a vision to incorporate residential development into the design of the resort. It was master planned by Bob Wells, who worked with the concept of owners Edgar and Polly Stern. Scott Jaffa, AIA, designs the home’s interface to the mountain as a secondary family foyer. “We orient homes to maximize the views and the mountain access, and we plan and build smaller, more thoughtfully designed homes with care to not duplicate spaces. 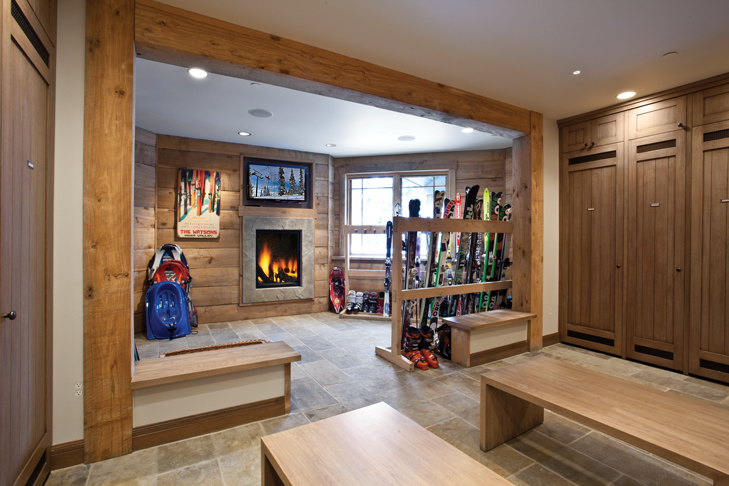 Ski access doubles as a mudroom and the family foyer. As a family foyer, a chandelier enhances first impressions, and the room becomes practical and functional with built-in benches, cubbies, and fireplaces. More than ski just access, this is a sports room with hiking shoes and trekking poles, toboggans, and bikes. We design and build for how people live, and that includes boot heaters, outlets to charge personal electronics, and smart home controls where an app shuts down the house as they leave or turns on systems on their return. While not everyone can have a home right on the slopes, other lodging types are making adjustments. Gary Francis notes that some of the outlying private golf communities have a private clubhouse at the resort where residents may ride the shuttle to the clubhouse and enjoy their own ski room and gym to mimic the experience of living on the mountain. A number of new luxury hotels, too, are built on the mountain and offer guests a slope-side experience. Park City Mountain Resort does not offer its own lodging on the mountain, but Andy Miller, Communications Director, notes that the resort has added lifts to enhance the convenience of skiing. The Silver Star Lift serves the Silver Star residences and commercial area, and the Town Lift allows skiers and riders to take the Quitting Time run to the Main Street restaurants for lunch and shopping. For the many downtown condos, the Town Lift sells tickets for direct access. As locals, it is easy to take the convenience of Park City’s access to the mountains for granted. However, talk to people in other western resorts, and there is a touch of envy about all the available access for not just skiing and boarding, but mountain biking and hiking, as well.